The Dwarven Theolodite was a sort of automated measuring device designed to explore and survey subterranean areas; this version is notable for its distinctive red "eye." Carnelian Theodolites are available from the Crown Store for 012001200 , and with the Wrathstone Collectors' Bundle. Its default name is "Rufus". Though Argonians do relish the elastic flesh of the Black Marsh Swamp Jellies, the whimsical names they give them refer more to their appearance than to their flavor. A Cantaloupe swamp jelly is an aquatic netch-like pet available from the Crown Store for 010001000 . Its default name is "Melonbobber." The Cave Bear Cub may miss its mountain home, but that just makes it twice as loyal to its mortal companion. 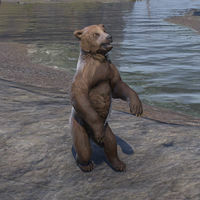 A brown bear cub released alongside the Orsinium DLC, available from the Crown Store individually for 00700700 or as part of the Orsinium DLC Collector's Edition for 050005,000 . When idle it may rear on its hind paws and play with a butterfly. Its default name is "Honeymuzzle". A denizen of Tamriel's northern shores, the Chub Loon survives on the bounty of the sea, dining on small fish of all types. Though clumsy and awkward on shore, it flies gracefully and is a nimble swimmer. Best of all, they make affectionate pets. 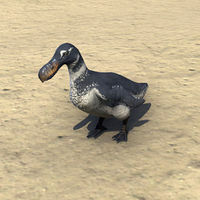 The Chub Loon is a pet available in the Storm Atronach Crown Crates as an Epic-level reward. Its default name is "Waddles". The Clockwork Shalk is a fabricant from the hidden laboratories of Sotha Sil. It seems programmed to obey the master it imprints upon, but who knows what secret orders it will follow if events occur to trigger them? The Clockwork Shalk was available in the Dwarven Crown Crates as a Legendary-level reward. Its default name is "Cogroach". 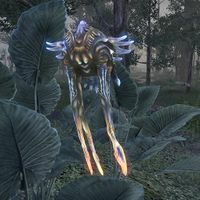 Originally designed for probing tiny, inaccessible areas of the Clockwork City, the mechanical Skeevaton can be set to recognize and follow an individual mortal, replicating pet behavior on the surface of Nirn. 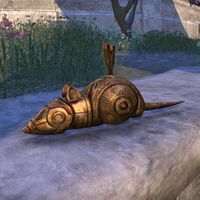 The Clockwork Skeevaton is a robotic mouse construct that is available from the Crown Store for 700 , or as part of the Clockwork City Collector's Bundle. Its default name is "Skweex". Of all the varieties of wild Senche-Cats, the Clouded Leopard may be the most beautiful. Their Cubs love to play-fight and stalk tiny bugs with the most hilariously serious expressions. 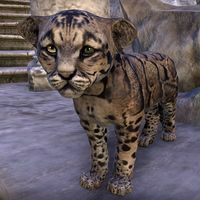 The Clouded Senche-Leopard Cub is a pet available in the Storm Atronach Crown Crates as a Legendary-level reward. Its default name is "Li'l Thundercloud". The blue-scaled Cobalt Sep Adder is the rarest of the wild varieties, and almost never seen in captivity. They are particularly prized by the royalty of Hammerfell's contentious city-states, as they're said to be able to detect poison in drinks and food. 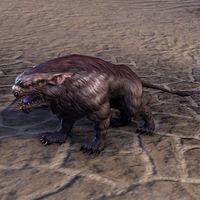 The Cobalt Sep Adder is a pet available in the Wild Hunt Crown Crates as a Legendary-level reward. 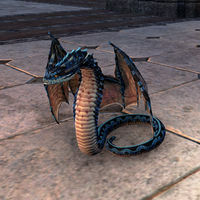 It was originally datamined as "Sapphire Adder" and had the description "Diagna, God of the Sideways Blade, is said to have created the lightning-blue Sapphire Adder by passing his orichalc sword over a common Sep Adder when he needed a symbol of Redguard ferocity during the first Siege of Orsinium. And fierce they are indeed! ", but was later changed. Its default name is "Poison Pals". Though Badgers mainly eat burrowing rodents, farmers hate them because they'll take chickens, kwama scribs, and bantam guar if they get the chance. Cranky and irritable, they make terrible pets - which makes them a favorite among the Undaunted. 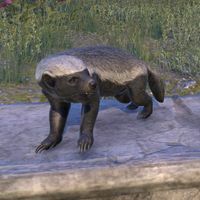 Colovian Badgers were available from the Crown Store for 00700700 , and later were a Superior-level reward in Reaper's Harvest Crown Crates. Its default name is "Grumps". 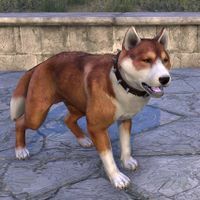 The Copperback variant of the Markarth Bear-Dog is renowned for its responsiveness to training, but keep an eye on it, or it will get into all sorts of mischief. Especially keep an eye on its eyes, which are two different colors! The Copperback Bear-Dog is available in the Dwarven Crown Crates as a Legendary-level reward. Its default name is "Winker". 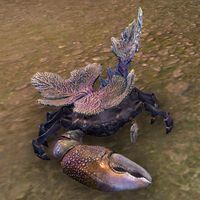 Native to Summerset Isle, the gaudy Coral Mudcrab has elaborate coral growths on its back, as well as a claw that looks comically over-sized, but which is surprisingly functional. Count fingers after petting. 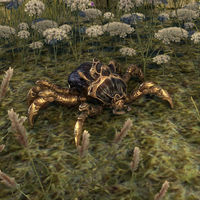 Coral Mudcrab is available from the Crown Store for 00700700 . Its default name is Scatheclaw. Credit for the irresponsible and foolhardy project of domesticating the Craglorn Welwa is usually claimed by the Iron Orcs, who are always looking for ways to prove that they're "more bad-tusk" than the Orcs of Wrothgar or Skyrim. 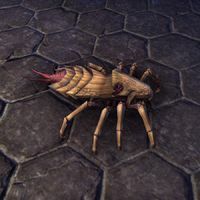 Craglorn Welwas are a domesticated variety of welwas that are available from the Crown Store for 700 . Its default name is "Ears gro-Loth'Na", which seems to be a reference to Loth'Na Caverns. If you're looking for a warm and fuzzy companion animal to cuddle with, don't start with the Crested Reef Viper. But if what you want is an intimidating reptilian monster that says "Don't mess with me, city boy," this is the ophidian follower for you. The Crested Reef Viper was available in Hollowjack Crates as an Epic-level reward. Its default name is "Spines". The caramel scrib crony is a quiet companion, devoted and easily housebroken. Crony Scrib pets come with the purchase of the official Fighters Guild Journeyman figure from Symbiote Studios (redeemable only on PC/Mac). Its default name is "Grubchum". The item was originally called "Pet Scrib". This page was last modified on 2 April 2019, at 02:12.